Jonathan O. Chimakonam: I am Igbo from Nigeria. I hail from the region at the eye of the rising sun, in the lands across the great Niger River, snaked through by the mystic river called Idemmili at the bank of which is the land of my ancestors, Oba. I come from the family of Okeke-mpi, in the lineage of Ezeneche, from the brave clan of Umudimego in Okuzu, a community on the hill. I trained as a philosopher, obtained my B.A honours from Ebonyi State University followed by a master’s and a doctorate degrees from University of Calabar, Nigeria where I currently work. It is an impossible angle to work from as a researcher like most universities in the Sub-Sahara with little or no funding and of course, no mentoring. For these, your development as a researcher is slow and you tend to make mistakes in the absence of mentors. But a sheer doggedness kept me going. Having gone through some really difficult times and experiences in my formative years as a scholar, I decided I was going to solve this problem for my students. So I gathered some of my postgraduate students and started the Calabar School of Philosophy initially as a mentoring club, which later metamorphosed into the Conversational School of Philosophy (CSP). Today, I am proud to say that I am the convener of this forum and its membership cuts across several universities on the continent and beyond. It has developed into a school of thought in African philosophy tradition and a movement of difference-makers in Africa’s intellectual history. 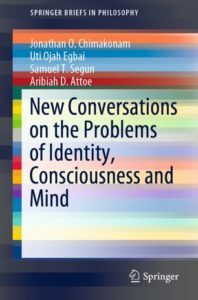 As a researcher, I aim to break new grounds in African philosophy by formulating a system that unveils new concepts and opens new vistas for thought (Conversational philosophy, 2015a,b); a method that represents a new approach to philosophising in African and intercultural philosophies (Conversational thinking, 2017a, b, 2018); and a system of logic that grounds them both (Ezumezu, 2017, 2018, 2019). I give everything to my research in African philosophy because above all else, I wish to be remembered as an African philosopher and not just a philosopher. RB: Have there been any particular influences to your philosophical practice? JC: Definitely, every philosopher has had some influence and mine is not different. I started off as a logician having been influenced by one of my teachers at Ebonyi State University (EBSU), Professor Uduma Oji Uduma. To me, he was more than a teacher. Back then in the Department of Philosophy, he was a figure that was larger than life. I remember our first year; we would gather in circles and discuss him. He seemed to have made a name for himself in the school generally. So, there were a lot of expectations and impressions about him. We were not sure what to expect and to make matters worse, he skipped the early classes thus prolonging the suspense. When he did turn up for his first class with us, I recall the tension, some of our colleagues who had a phobia for logic were scared to death, others were too excited, but I remember I was focused on discerning what made the man think. You could see inspiring confidence with a touch of challenging arrogance in his demeanour. A combination of these two traits was not lacking in Dr. Joseph N. Agbo, our firebrand lecturer at EBSU and an unabashed Marxist, a virus, unfortunately, he could not infect me with, much as he tried. While Uduma challenged me the most, Agbo was the one who inspired me the most. I think it is safe to say that the influences from these two were basic in my formation as a scholar. Over the years, I have come to realise that a good scholar must have a tincture of confidence and arrogance; confidence, to inspire their students and arrogance, to challenge them. The humble and timid scholar, no matter how brilliant, neither inspires nor challenges anyone and that makes them a bad scholar as far as I am concerned. The academe is no place for timidity or the idea of humility bandied around nowadays. Humility is a concept that is terribly misunderstood and misinterpreted, especially in the African academe rift with jealousy, fat ego and mediocrity. The idea of academic modesty or humility encourages peers not to brag about their accomplishments in ways that would rub others’ failures or under-achievements in their faces. It does not discourage inspiring confidence and challenging arrogance. A certain level of corkiness is important in the academia. Unfortunately, fat ego mediocres in the African academe waste valuable research time castigating and plotting the downfall of their more aspiring peers who represent the true spirit of the academe, that of inspiring confidence, challenging arrogance, charisma and charm, all of which my two teachers above possessed. After my honours programme, I went for one year mandatory national youth service. Returning, I went to University of Calabar (UNICAL) for my postgraduate programmes upon the recommendation of Dr. Kanu Macaulay, an amiable gentleman that supervised my honours project. I wanted to continue my studies in logic and UNICAL appears to be the ideal place. There was Professors Princewill Alozie who was retiring as at the time, Chris Ijiomah, Andrew Uduigwomen and Dorothy Ucheaga (now Oluwagbemi-Jacob), and both Professor Uduma and Dr. Kanu had been trained at UNICAL, Uduma in his undergraduate and Kanu through to his doctorate. It was during my time as a postgraduate student that I began to study African philosophy. The African philosopher and metaphysician Professor Innocent Asouzu was already well known for his metaphysical system dubbed ‘ibuanyidanda ontology’. I did not take any of his classes but I took time to read his works. Even though I conducted my master’s and doctoral research in the field of logic, moderated by Uduigwomen and Ijiomah, I did a lot of personal studies in African philosophy. It was in African philosophy that I became heavily influenced as a researcher by the trio of Innocent Asouzu whose thinking style I adopted, Pantaleon Iroegbu whose writing style I adopted and Campbell S. Momoh, whose radical style I adopted. Today, I am probably known in the academia more as an African philosopher than as a logician. 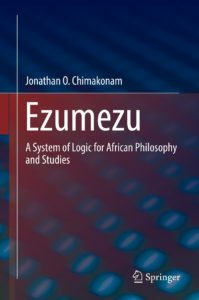 My contributions to knowledge in the folds of conversational thinking, conversational philosophy and Ezumezu logic have been shaped by influences from the three African philosophers above. I am grateful to them for influencing my research and to Uduma and Agbo for shaping my character as a scholar. This is not to suggest that others who taught me at various levels have not contributed anything to my development, they all did one way or the other and for which I am grateful, but I am here focusing on two specific forms of influences, my character as a scholar and my research. JC: Well, that question can have different answers depending on the inclination of the philosopher. But for me, I would like to say that Reductive Physicalism and Non-reductive Physicalism are shaping most philosophers of mind nowadays. While the Reductive Physicalist position holds that with time, scientific accounts would be able to explain all mental states and properties, the Non-reductive Physicalist position holds that the predicates we employ in describing mental states cannot be reduced to the language and lower-level explanations of physical science, even though the mind is not a separate substance. There is this movement towards monism and away from dualism. You see, the days when substance dualism was the pop culture of the field are in the past. The influence of religion has since waned following the collapse of the Holy Roman Empire and the displacement of supernaturalism by science as a framework of choice. The individual is no longer largely seen as an entity with two aspects; one physical and the other spiritual. 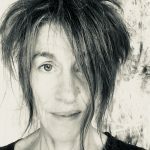 Scientific understanding of the human being is gaining prominence due mainly to the works of the neuroscientists which influenced the neurophilosophers, of which Patricia Churchland is the egg-head. When you study the works of physicalists like Daniel Dennett and those of the neurophilosophers, you would understand why physicalism (of different shades) is making more sense in this science-guided era than say the metaphysical option promoted by consciousness scholars like David Chalmers. With physicalism and neurophilosophy, there is hope and a clear path for the realisation of that hope, that one day scientific explanations can help us make sense of it all. But the metaphysics of consciousness, the type hyped by Chalmers and inspired by Thomas Nagel’s ‘what is it like to-be-a-bat-experience’ does not offer similar level of hope. This latter position excites the mind no doubt, but does not inspire much hope. From the foregoing, you can see why the contemporary understanding of identity is going the way of physicalism. What makes me, me? This question tends to suggest a sort of introspection until we ask again, what makes me different from others? Then we begin to understand that the question of identity is not an internal thing, it is a social phenomenon. My identity can only be sorted out in connection with the identity of others. It is a property that identifies me from others and identifies others from me and since the interaction between me and others can only be created in a physical space, identity becomes a social phenomenon. The African conception of the self as articulated by Chukwudum Okolo, in a way, can be likened to a physicalist position on identity. JC: Of course, in the past, there was the spell of Plato of the dual conception of reality, and the Aristotle’s hegemonic logic which grounds it. This spell was conjured up from the influences of Parmenides, Heraclitus, Anaxagoras and so on in the ancient period and was then re-enforced in the modern time by Rene Descartes in his conception of the ‘self’ and rescued by Immanuel Kant from the animadversions of the sceptic David Hume. It is this spell that hoisted dualism and attempted to make it hegemonic. By the dualist conception of the self, an individual could be composed of two separate substances, for lack of a better characterisation, mind and body. The problem in it for identity is where personal identity lies? Is it the mind or the body? Since identity is taken on the face-value to be that important property that makes an individual whom they are and different from others, the temptation is to assume that identity should lie with the superior component. But how do we know which is superior between mind and body? This is where the over-bearing influence of religion comes in. The medieval era was a period when supernaturalism rather than science thrived and a period when faith rather than reason dictated the direction of knowledge. And of course, the Holy Roman Empire was not a system to be challenged without dire consequences. Many scholars ended up either executed or thrown into the dungeon for daring to question the reality or authority of the divine. So, in the past which peaks at the blissful period in the matrimony between the Church and the State, the individual is composed of body and soul, and the spiritual soul is necessarily superior. Overtime, this entity has been called by different names, including mind, even though there are nuances in what it is taken to mean at each point. But my use of the mind here should be seen as a consistent continuation of the idea of the soul, at least in terms of ontological categorisation. So, in those days, the spiritual soul or mind was where identity lies and this was very popular because most philosophers not only wanted to survive their bodily death, they still didn’t want to miss heaven. But nowadays, with the rise of science and the liberation of reason, we know better. This is not to suggest that dualism no longer have faithful followers, it does, after all religion still maintains some influence around the world. JC: I guess I would have to answer the question from my own perspective. I hold a physicalist position, a body-only model. Is it not fascinating that after the days of Plato when the body was trivialised as ephemeral and those of the medieval and even in Descartes’s time, some scholars could today prioritise the body as the seat of personal identity? Yet, that is the reality before us. We have been wrong about the body all along. There is no shame in turning around when a more reliable vision is available and in even denying the mind as a spiritual substance. Really, I prefer to talk of the brain rather than the mind except when my conception of the mind is indistinguishable from my understanding of the brain. I believe that those functions people usually attribute to the mind are really performed by the brain and the brain is part of the body. However, my idea of what makes up personal identity is encapsulated in my theory of sense-phenomenalism which is a body-only model. But there is a twist to my version of body-only model, it focuses on those parts of the body that are perceptible through the senses. I cannot for example, perceive someone’s brain, so the brain is not a part of the properties that make up personal identity. It is by perceiving the unique bodily features of an individual that their identity is sorted from a group. Some of these features include vocal vibration, eye, finger-print, facial properties, ear lobe, skin and shape, etc. But these bodily features or characteristics are not in themselves the concept of identity, they are biological features while identity is an abstract idea generated from them. RB: You use the term ‘sense-phenomenalism’ as a model to offer an explanation to personal identity problem. Can you say more about this? JC: Yes, this was also because I wanted to specify and clarify the type of physicalist position I advocate. A good number of physicalist theorists have a penchant to uphold the brain or the neuronal processes as bastions of personal identity, mainly because these are the zones of memory, will and consciousness or indeed anything that points to the mental states. But I am convinced that identity is a social phenomenon that manifests on the senses. Memory, will and consciousness are without doubt, important parts of an individual’s life experiences but we make a mistake when we attempt to locate identity in them. At such a time, we are moving away from what the focus of identity should be. Those who want to drag neuronal and mental states into identity are merely overloading the concept of identity and they are influenced, howbeit small, by the medieval adoration of the soul as a superior component. Since they are no longer committed to the existence of the soul and its blurry metaphysics, they have found a way to transfer the adoration, usually extended to the soul, to the brain and the neuronal process which are now believed to perform most of the functions previously attributed to the soul. Recall that some physicalists reject the soul or mind but not most of its functions. They merely re-assign those functions to a different entity they now subscribe to, notably the brain and the neuronal process. Proto-phenomenalism and equiphenomenalism propounded by Aribiah Attoe and Samuel Segun respectively, both of the Conversational School of Philosophy, can fairly fit into this frame of thought. From the foregoing, one can easily see where sense-phenomenalism borrows ideas from African philosophy and where they part ways. For example, the notion of relationship and the social conception of identity (as something that comes alive in a group rather than in an isolated individual) were inspired by African philosophy, but the idea of body-only model breaks away from the dualistic conception of reality prevalent in African thought in which the ideal is prioritised over the real. One problem that can easily be identified in sense-phenomenal conception of identity is the implication of nmeko to some of the ideals of the individual as an end in itself. Well, this has a direct answer: sense-phenomenalism focuses on the empirical or bodily features of the individual and not on the metaphysical and ethical endowments of the individual. The social character of identification does not interfere with the inner qualities of a person as an autonomous being, but the former gives us basis to judge the latter. Besides, in the relationship of identities, each identity is not dissolved into others but sorted out from others. It is difficult to realise the uniqueness of an individual’s identity if not compared with those of others in a group. This is what sense-phenomenalism is about. RB: What is ‘conversational thinking’ and why do you think it’s important? JC: Well, let me begin by saying that Conversational thinking is not an isolated concept. To understand what it is, one has to understand my research formation which includes Conversational philosophy as a theory, Conversational thinking as its method and Ezumezu as its background logic, as I stated at the beginning. So, we can see that conversational thinking is kindred to two other concepts. Your question however centres on conversational thinking. The idea of conversational thinking traces back to the Igbo notion of “arụmarụ-ụka,” which roughly translates to “engaging in critical and creative conversation.” Now, this engagement is a relationship of some sort which is why we teased out nmeko meaning relationship as the core notion of conversational thinking. Basically, it is a method of philosophising that predicates the study of reality on the notion of relationship. It has four components namely, (1) ‘conversational exercise’ which raises the question of who is saying what? (2) ‘contextual consideration’ which raises the question of in which context are they speaking from? (3) ‘critical engagement’ which raises the question of what are the critical questions that can challenge those ideas? (4) and ‘creative struggle’ which raises the question of what are the new concepts and thoughts that can be generated to enrich, disprove or amend the existing proposals? So, in conversational thinking, there is some deconstruction and a bit of analysis. There is also reconstruction prominent in the idea of creative struggle. But above all else, there is contextualisation. The above combination makes conversational thinking immune to the problems of strait-jacket and determinism found in some methods in Western philosophy, and this is due to its grounding in an alternative system of logic called ‘Ezumezu’. Its importance is made further manifest in the fact that it can mediate discourses across intellectual borders such as intercultural philosophies. In a recent co-authored paper, Uti Egbai and I (2019) attempted to demonstrate that it might be better than dialogue and polylogue. It is also, curiously, a philosophical contribution from African tradition which mounts serious challenge to some of the best models from the West. Above all, conversational thinking purveys a new way of philosophising which can be applied universally. The house of philosophy is never saturated with new systems or methods. Today, there is an intellectual movement or a school of thought that has emerged in African philosophy called The Conversational School of Philosophy (CSP). This school which started at the University of Calabar, Nigeria, was inspired by the thoughts of Pantaleon Iroegbu, Campbell Momoh and Innocent Asouzu. Today, members of this school can be found in universities in Africa and beyond. They have adopted and endorsed the method of conversational thinking and have now taken it upon themselves to develop and apply it in different ways. Mention must be made of Victor C. A. Nweke of the University of Koblenz-Landau, Germany who is developing and applying conversational thinking in the areas of education curriculum and political theory; Uti Egbai of the University of Calabar Nigeria in the areas of women studies and intercultural philosophy, Fainos Mangena of the University of Zimbabwe in the area of philosophy of race, Maduka Enyimba of the University of Calabar in the area of development studies, L. Uchenna Ogbonnaya and Diana-Abasi Francis in the area of metaphilosophy, Aribiah Attoe of University of Johannesburg in the area of methodology, Mesembe Edet of University of Calabar in the area of socio-political philosophy, Ada Agada in the area of metaphysics, Chukwueloka Uduagwu, Chiaghana Ejesi and Chukwuemeka Awugosi in the areas of philosophy of language, poverty research and ethics of personhood respectively, Leyla-Tavernaro-Haidarian of the University of Johannesburg in the areas of ubuntu research and epistemology, and the list goes on. JC: Heraclitus, we are told, in a bid to dispel the claim of Parmenides against the possibility of change or motion, famously declares that the world is in perpetual flux and that one cannot step into the same River twice. Also, let us not forget the less talked about Cratylus, who responded by saying that one cannot even step into the same River once. But these extreme conceptions of motion do not depreciate the value of stability, neither does the idea of stability over-rule change. This is not to suppose that I subscribe to the idea that personal identities are capable of regular changes due to the influence of the Hi-tech evolutions in our world today. But we must admit of some disruption to the order. Thanks to digital and social media technologies, what can be called ‘artificial or digital identities’ are now possible, leading to yet another revolution which, for lack of a better word, I would like to dub ‘multiplication of identities.’ This definitely seems like a continuous flux of identity, but in what forms? Whilst we cannot overlook and trivialise the fact that individuals may now create digital identities for themselves, whilst it is no longer possible to discount multiple identities, there is something we must call the ‘persona identity.’ It is the original copy, the physical human from which the digital and sundry types of identities of an individual are created. If we admit of changes in the forms of identity digitisation or multiplication, we cannot do the same to the persona identity, and this, to me, seems stable. So, perhaps, it may now be advisable to always clarify which identity one has in mind, the persona or the digital, the original or the copy. But, it is difficult to claim that the persona identity can be in a state of perpetual flux. However, as much as we would like to elevate the persona over the digital, it has to be borne in mind that the digital, perforce, is an active identity as well. People are able to create impressions and be recognised through their digital identities in today’s world of the internet. A great volume of commerce involving a lot of money and valuables are today conducted online on the strength of digital identities. So, digital identities are not necessarily fake identities, they are copies. The danger though, is that by the same aid of digital technologies, these copies can now be multiplied. Multiplication of identities should not only be criminal, it should be immoral. Nowadays, in the social media, we see individuals create accounts with their facial and bodily properties but with different names other than theirs. Or, they may use their names with different bodies. They can also choose a false location, social, educational and economic status. They can cover up their tattoos and other bodily features or create fake tattoos and other bodily features. By so doing, one individual, may now have multiple identities in the same or different social media platforms. What is happening in the world of online commerce is the increasing sophistication of internet securities to prevent and detect multiplication of digital identities. But this is because monies and valuables are at stake. Many of the social media giants like Facebook are beginning to do the same. A lot of terrible things including fraud and terrorism have been done through the social media by those who were able to multiply their identities and this is creating concerns. It is no longer monies and valuables that are at stake, lives now are. Identities therefore should not be allowed to be in continuous flux because it can create the room for bad things to happen.